If you have been involved in a car accident, it is inevitable that the other party’s insurance claims adjuster will call you the same day as the accident occurred or within 24 hours. The insurance adjust does not have your best interest in mind and will do everything possible to convince you to settle your case without hiring a lawyer. Furthermore, without proper legal representation by a New Jersey auto accident lawyer, the adjuster will use every trick possible to get you settle your claim for a fraction of what you deserve before you even have the chance to hire representation. Insurance companies have one goal in mind, to settle personal injury claims for as little as possible, but in the quickest manner possible. Insurance companies evaluate their adjusters based on their “turn over” rate of insurance claims. The faster and cheaper the adjusters close claims, the more money the insurance companies will make. Therefore, the adjusters will do everything they can to persuade the claimant not to seek the legal representation of a New Jersey auto accident lawyer. The adjusters will use various ploys to prevent the claimant from hiring a lawyer. These might include telling the claimant that an attorney will not make the claim more valuable or that such a move will even slow down the claims process. Whatever tactic the adjusters use, it is clear that they much prefer to deal with unrepresented claimants. Once a New Jersey auto accident lawyer enters the picture, the adjuster’s job becomes a lot more difficult, and the claim increases in value and will take much longer to settle. The adjuster will have to go through the New Jersey auto accident lawyer for any information or communication he or she needs with the claimant. Do not fall for these cheap tricks the insurance companies will use to lure you into settling your claim far less than you actually deserve. Do not talk to anybody until you consult with a New Jersey auto accident lawyer. 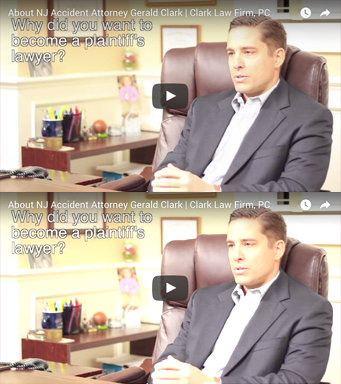 If you have any questions, or would like to speak with a New Jersey auto accident lawyer regarding your car accident, please do not hesitate to contact one of the experienced New Jersey personal injury attorneys at the Clark Law Firm, PC. Call 877-841-8855 or fill out the form on this page to schedule a free consultation.